Congrats! You have full cheeks, plump lips and a strong bone structure. Your skin is still fabulous and you emit a wonderful radiant glow. However, early signs of fine lines may have started to appear due to repetitive movements, smiling, squinting, frowning, hormonal changes and possibly some UV sun damage. Preventative maintenance is key in your 20’s; and the perfect time to start being proactive. Injector 5280 has many subtle options available to help you. Make the most of your beauty while you’re at your best and maintain your youthful appearance for years to come. And of course, don’t forget to add a VI Peel to your treatment for the final touch, to improve your skin’s overall texture, clarity and glow. Your 30’s are the milestone that marks the transition to maturity and marks a decade of wonderful life changes. However, you might have noticed your skin isn’t looking as flawless as it did in your 20’s. The first noticeable signs of aging are starting to appear and gravity is taking its first inevitable effect. Collagen production decreases in your 30’s and your skin naturally starts to lose it’s elasticity. This in turn can diminish your youthful glow and once supple appearance. You will begin to see less volume in your face, especially in your cheeks, and your eyebrows will sit slightly lower. Fine lines will appear deeper, leaving lasting marks even when you’re relaxed. Proactive maintenance is the key to looking young and now is the time to start managing your beauty wisely. Once you start seeing those subtle changes in the mirror, it’s vitally important to take action since you are setting the foundation for the years ahead. Injector 5280 are here to help you create a regime, so that not only will you look better than you ever have done before, but you will also maintain your youthful features. Make beauty management a priority in your 30’s, and you will be reaping the rewards for decades to come. Over the hill? No way, the 40’s are the new 20’s. Now is the time to get serious about maintaining your beauty. Through the abundance of joyful and stressful life experiences, combined with the natural aging process, people in their 40’s start to show their age. This is mostly due to elastin fibers starting to slacken and decreased collagen production. You may see ‘worry’ and ‘laugh’ lines becoming a little deeper and multiplying, and your face losing its fullness. Your eyebrows may be sitting lower and your undereyes may appear hollower. Your cheek volume will start to migrate to your lower face, eventually creating jowls and a loss of jawline definition. Don’t let gravity and life experience win the battle of youth. You are still young, and while still in your 40’s you have every potential to reduce the signs of aging. Injector 5280 offers a combination of non-surgical aesthetic procedures that will rejuvenate and restore your youthful appearance. There has never been a better time to take your beauty management seriously. Choose to be proactive now and take back the years. The 50’s are frequently described as being the best years of your life, marking a decade filled with more wisdom, experience, money and more ways to look your best. You are feeling active and vibrant, and you want your outer appearance to reflect your vitality. At this age it’s vital to start looking deeper than just the surface of your skin. You will need to consider the changes that are occurring below the skin, including the loss of collagen, hyaluronic acid, fat, muscle, and even bone. If you are not careful, your face will continue to lose volume; your facial contours will begin to lose their once prominent appearance and wrinkles will become more visible. The displacement of volume from the upper face to the lower face will create noticeable jowls and a loss of jawline definition. Wrinkles will start to become more pronounced and you will see loss of volume in areas you haven’t noticed before, including your neck, chin, lips and the back of your hands. Injector 5280 is here to help create a proactive regime for you. Despite what you might think, it is absolutely possible to defy gravity and restore your youthful look. It’s never too late to start feeling and looking your best. Our goal is to create a refreshed, rejuvenated and younger version of you, keeping you confident and looking your best yet. The 60’s are the new 40’s! You are in your prime and want the mirror to reflect the youthfulness you feel inside. 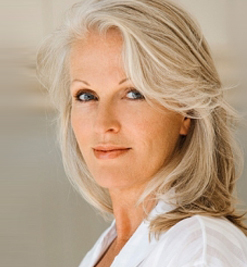 Over the decades ahead your priority will be to age gracefully and maintain a well-kept, natural appearance. Wrinkles can multiply very quickly in your 60’s. They can also become deeper, especially around your mouth and neck even when you’re relaxed. Due to gravity and the loss of elasticity in your skin, the upper face will be sitting lower; your eyebrows will droop and your undereyes appear hollow. Meanwhile the gravitational pull to the lower face can create a jowly look, resulting in a loss of jawline definition. Fortunately, aging doesn’t have to be daunting. Injector 5280 has many options available to you. Our goal is to restore your facial contours, balance your features, smooth and soften your wrinkles, as well as giving your face more dimension.